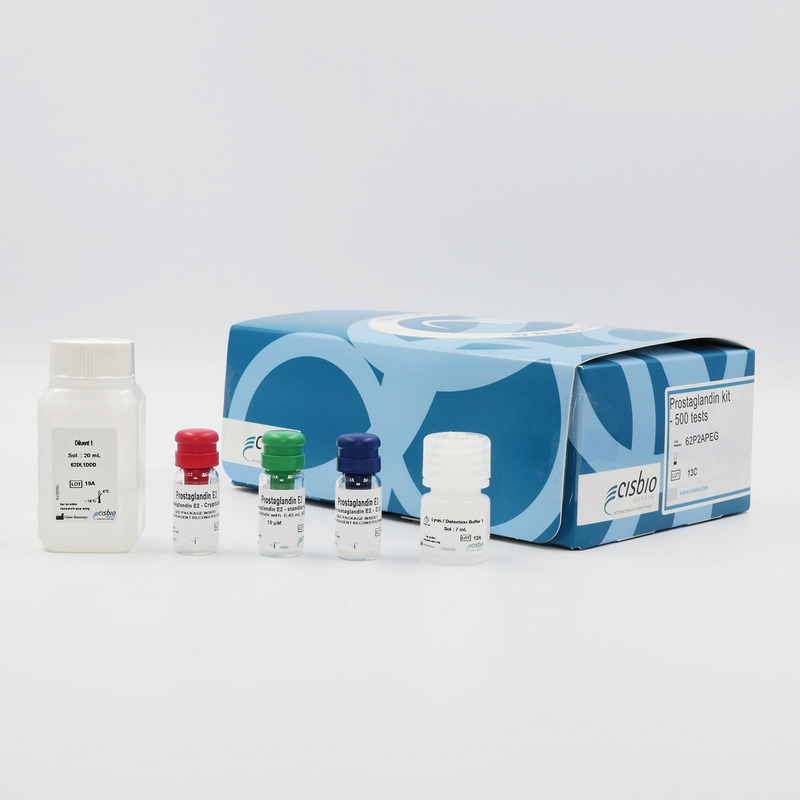 The Prostaglandin E2 kit is designed for the rapid detection of PGE2 in cell supernatant and whole cells. Prostaglandin E2 (PGE2) is produced in multiple cell types from PGH2, a primary product of the arachidonic acid metabolism, via the prostaglandin synthase. PGE2 displays several biological functions, such as vasodilatation and smooth muscle relaxation, and is involved in pro- and anti-inflammation pathways. PGE2 production is a commonly used method for the detection of COX-1 and COX-2 modulation. The PGE2 kit is a highly sensitive method for quantifying PGE2, either in cell supernatant or directly in whole cells. The PGE2 assay is based on the competition principle, where native PG2 produced by cells and d2-labelled PGE2 compete for binding to a monoclonal anti-PGE2 antibody labelled with Europium Cryptate. The assay can be run with several types of samples, such as cell supernatants or purified enzymes. The PGE2 assay features a streamlined protocol with only 1 incubation step after sample and PGE2 detection reagents dispensing. This protocol requires a single 5-hour incubation period at RT. The PGE2 assay has a high level of flexibility. It can be performed using cell supernatants or directly on stimulated cells. The incubation time and temperature following addition of the detection reagents have little effect on the assay results, providing further assay flexibility. One benefit of the HTRF PGE2 assay is its ability to quantify PGE2 in the presence of cells without sacrificing assay performance. The results comparing direct cell-based versus supernatant transfer did not differ significantly. Monocytes were stimulated to produce PGE2 in the presence or absence of indomethacin, a known inhibitor of PGE2 production. The IC50 of indomethacin determined using HTRF technology (1.0 ± 0.4 nM) was in agreement with previously published data.